We’ve seen many large companies, particularly automakers, rest on their laurels and become insular organizations. It’s easy to get into this rut when you measure profits in the billions and you have a huge bureaucracy. But we’ve also seen how this attitude can lead to disaster, with the auto industry being just one example. Remember Atari? The flip side to measuring profits in the billions is measuring losses in the billions as well when things go wrong. The culture at Ford seems very different today as the company tries to demonstrate each year in its Further with Ford conferences, where media members, bloggers and social media influencers from a wide variety of backgrounds are invited to hear from company officials, attend panel discussions from thought leaders, and of course get introduced to new Ford products and initiatives. 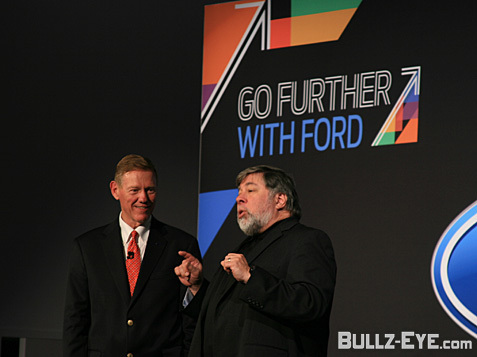 We were happy to attend the Further with Ford conference again this year, and CEO Alan Mulally kicked things off with an address on Monday night and was joined on stage by tech icon Steve Wozniak who would join the technology panel the next day.